This stock of tablets is normally sufficient for one season. Please download our full testing instructions pdf for further details. BLUE CRYSTAL is an advanced method of biocontrol which provides protection against both algae and bacteria, all year round. The unique method requires minimal maintenance offering greater flexibility than other systems. Pool water treated with Blue Crystal is hygienic, clear, odourless, and tasteless. BLUE CRYSTAL provides an excellent alternative to chlorine. SEE the difference, FEEL the difference with Chlorine Free BLUE CRYSTAL. 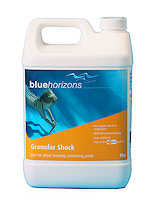 Used with a shock dose treatment of your choice Blue Crystal provides an excellent alternative to chlorine. Chlorine has a different role in this situation compared to a pool treated only with chlorine.